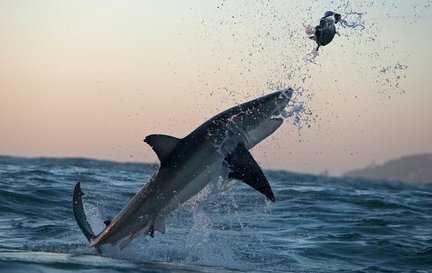 Great Q & A with Chris Fallows the South African photographer and adventurer responsible for "Air Jaws". "Most people try to stay as far away as possible from great white sharks, given their immense size and raw power. But not Chris Fallows, the South African photographer and adventurer who returns to Discovery Channel on Sunday to kick off the 23rd edition of its annual Shark Week with "Ultimate Air Jaws." Like its predecessors ("Air Jaws" and "Air Jaws 2"), the new special tracks Fallows as he captures images of great whites as they breach out of the water as they hunt for seals off South Africa's Seal Island. What's new is the state-of-the-art high-definition cameras he's using, which shoot 2,000 frames per second, offering the clearest view of these attacks ever. Footage of a one-second breach can be slowed down and studied in great detail, down to the number of teeth in each shark's mouth."